Eunice M. Anderson, 100, of Cambridge, died Thursday, March 21, 2019, at Hillcrest Home, rural Geneseo. Funeral services will be held at 1:00 p.m. Monday, March 25th, at the Cambridge Lutheran Church. Rev. Randall Mullin will officiate. Burial will be in Rosedale Cemetery, Cambridge. Visitation will be one hour prior to the service at the church. Memorials may be made to the Cambridge Lutheran Church. Stackhouse-Moore Funeral & Cremation Services, Cambridge, is assisting the family with the arrangements. 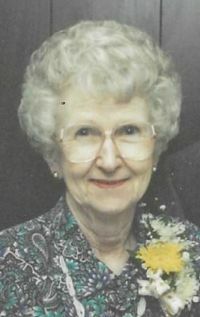 Eunice Marie Peterson was born February 23, 1919 in Ophiem, Illinois, the daughter of George and Ruth Riley Peterson. She was educated in the Alpha area and graduated from Alpha High School in 1937. Her marriage to Benjamin Anderson took place on January 25, 1942 in Ophiem. He passed away June 8, 2004. She was employed as a cook at the Cambridge High School for a number of years. Eunice went to Hillcrest Home on Tuesday mornings for years to fix hair for the residents. Her memberships include the Cambridge Lutheran Church and its WELCA women's group. She enjoyed gardening, baking, and spending time with all of her family. Those surviving are two daughters and a son-in-law, Linda Nagle, Galesburg, Pamela and Eugene Kuehlthau, rural Cambridge, and three grandsons, Wesley Kuehlthau, Jacksonville Beach, FL, Justin (Allison) Kuehlthau, Mt. Prospect, IL, and Nathan (MinhNhat) Kuehlthau, Da Nang, Vietnam. Other survivors include three great grandchildren, Jackson, Preston, and Emmerson Kuehlthau. Her parents, her husband, a sister, Velma DeBates, two brothers, Glenn and Eugene Peterson, and a son-in-law, Roland Nagle, preceded her in death.